Zara, Jordan, Makayla, Hannah, Chris, CJ, Cooper, Georgia and Lion John Claringbold at the Licola camp. 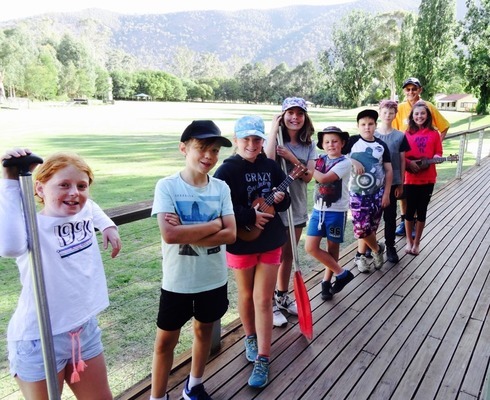 Eight students from three local primary schools enjoyed five days of outdoor activities at the Lions sponsored Licola Wilderness Village adventure camp. Zara, Jordan, Makayla and Hannah from Barwon Heads, Chris and CJ from Surfside, Cooper and Georgia from Ocean Grove, participated in a broad range of activities, including canoeing, raft building, the giant swing, the flying fox and learning to play the ukulele. Outdoor education staff and coordinators at Licola made sure everyone was aware of the camp’s expectations. These highlighted the importance of looking after one another, teamwork, cooperation, problem solving and tolerance. The weather was perfect for swimming in the pool and in the Macalister River, where raft building and canoeing also took place. Other activities included archery, obstacle course and low ropes. Gaga ball game and trampolines were also in high demand. There are over 20 different activities to participate in at Licola. In the evenings there were games in the gym, a night walk, movie night and the final concert, where each group of students performed on stage to the delight of the audience (120 students, 25 volunteers and Licola staff). This is such a valuable program for these primary school students and they are always looking for sponsors to enable more children to attend. If you would like to sponsor a local child ($310) or be a volunteer for the January 2020 camp, contact Lions Club of Ocean Grove- Barwon Heads (John Claringbold, 0425-750 387).